LISTEN: The Inspired Leadership Show with guest, Linda Popky. Discover secrets of being an effective leader thru communication, positive influence and sustainable productivity. Article: The just-in-time effect: How Amazon and Uber have changed associations. Linda discusses how to survive in a just-in-time world on MultiBriefs: Exclusive. Article: What Boeing Can Learn From Oncologists and Hackers. Linda talks about the value of good user experience on C-Suite Network. Article: Are you being served? What about your customers?. Linda discusses how to satisfy customers on MultiBriefs: Exclusive. Article: Two Successful Female Business Partnerships on Life Lessons at 50 Plus. Linda Popky and Lisa Anderson who talk about being co-executive directors of the Society for the Advancement of Consulting (SAC). Podcast: "We Built This City" - Linda Popky shares stories about her 40+ years in tech marketing in Silicon Valley. She says, "Don't ever listen to somebody who tells you you can't do something." - Listen! Podcast: Interview of Linda Popky about Using Friction to Improve Your Marketing by Gene Hammett on Leaders in the Trenches. SAC® Press Release: "Nominations Open for Advancing Consulting Award" - Linda Popky says this award will acknowledge the work done by sole practitioners. – Read release. 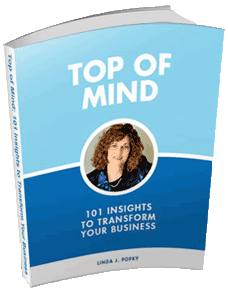 Podcast: Linda Popky interviews Michelle Tillis Lederman who discusses the difference between networking and connecting, and discusses the seven mindsets of connectors. - Listen. Take our Marketing Above the Noise Assessment. Video: Just a Moment for Marketing: One-minute videos that focus on a marketing tip or anecdote. – View over 100 videos. Purchase PDF or ePub book. Book Video Trailer How can your message be heard in today's crowded, chaotic environment? 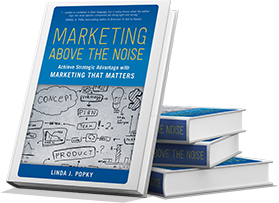 Learn more about Linda Popky's new book, Marketing Above the Noise: Achieve Strategic Advantage with Marketing that Matters, in this short video trailer. Introducing Dynamic Market Leverage™, an approach to help cut through the clutter, stand out, and effectively build business. Copyright © 2019 Leverage2Market Associates. All Rights Reserved.